This photo was taken on 5th April 2011, which is 9 days before the Sarawak Election (16th April 2011). 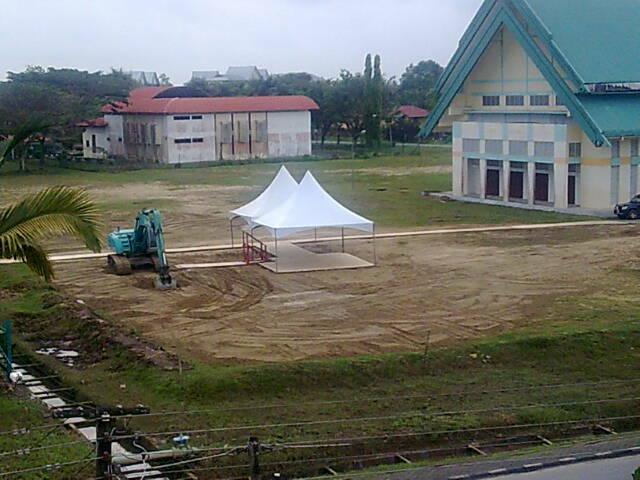 You can see that there are 2 canopies setup in the middle of an empty land, and according to our Mr Taib, he will build a stadium for SMK Kai Chung there. 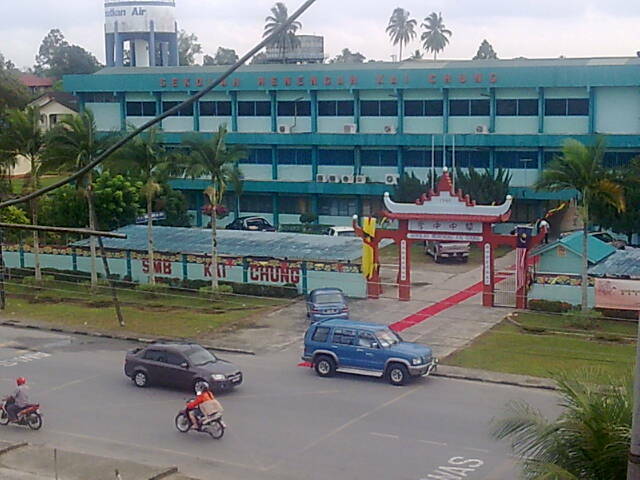 FYI, SMK Kai Chung is a secondary school in town area of Bintangor (I was a student there, years ago), and there will be an opening ceremony by Mr Taib for the Stadium construction tomorrow (8 days before Sarawak Election). According to the friend of mine in Bintangor, they start the land clearing, sand pouring on that piece of empty land few days ago, and the canopy setup today. I am going to repeat this: they start clearing the land few days ago, and the opening ceremony for the Stadium construction will be held tomorrow, which is also 8 days before the Sarawak election. Why can't he do it earlier? There is no news, rumors, planning about the Stadium construction months ago and suddenly, why now? Doesn't this sound fishy? I live in Bintangor from year 1984 until 2000, and I will say that this is one of BN's way of cheating people and win their heart to vote for them. I am not sure about this SMK Kai Chung Stadium (let see if they do it or not after the election), but there is a story I am going to tell about the TAR College in Bintangor. When I was a kid, still in primary school, I heard people saying that government will built a TAR College in Bintangor, and I remember they start clearing the land at that time. I have this imagination in myself that most probably I will be able to continue my study in this TAR College of Bintangor. After some time, I am not sure why, people are saying that the project is being postponed for some reason. And these process keep repeating. I don't understand why when I was a kid, but I start to learn that this is the trick played by our government and Mr Taib to fool us. Each time before an election, they will start doing something, most probably involve lorries, and they will make it look like they are rushing to complete the project. And every time (yes, I am very sure EVERY TIME) after the election, even thought BN representative is elected, the project stop, for some reason (lots of different reason each time). 3 years back, at the 2008 election, same process, lorries start to move carrying sand, non stop work, big spotlight at night, at that "TAR College" construction site. I remember people are saying that "THIS TIME IS REAL". And exactly after the "THIS TIME IS REAL" election, it stop, as usual. This time they blame PR for causing the project to be ended (I forgot the detail of their excuse). So, the reason I am writing this is to wake all of us up, that never ever believe on what BN or Mr Taib is promising to our Sarawak. The TAR College story is in Bintangor, and I believe there are thousands of promise said by them in different area of Sarawak. Stop believing to what they say and try to see what we have in Sarawak today. What has been done in these 50 years (1957-today)? Try to compare our Sarawak (full of natural resources, woods, petroleum) with Singapore (small island) and Brunei. What in Sarawak that we can say we are proud of? For all Sarawakian, please come home to vote to non-BN parties, and stop Mr Taib from sucking up the whole Sarawak. Who doesn't know that the Pek Mo is sucking up all our money? kai chung doesnt even need a stadium...well, at least not the critical need. the bintangor stadium is just a few minutes journey from there. i do remember the "TAR college"...it was postponed and trees was grown there but the funnt thing is they grew some kind of a "pine" tree (wth???) then it was chopped down and left again. MR TAIB like to do nonsense things and gv the empty promise.. DO NOT BELIEVE WAT HE SAY..
Hey ya, my very close friend has actually asked the President of TAR college(KL) about the plausibility of setting up a TAR branch in Bintangor and his replied was "NO SUCH THING!". So, it's so proven that it's just a gimmick! Thinking those BN/Gov officer/staff also won't send their child study there. just a words where ia our TAR college.....BN?